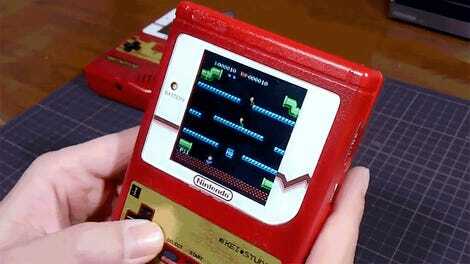 The original Game Boy was the first device to push my fascination with gadgets to an obsession. I saved for months to buy one, and to this day it’s still one of my favorite gaming platforms. 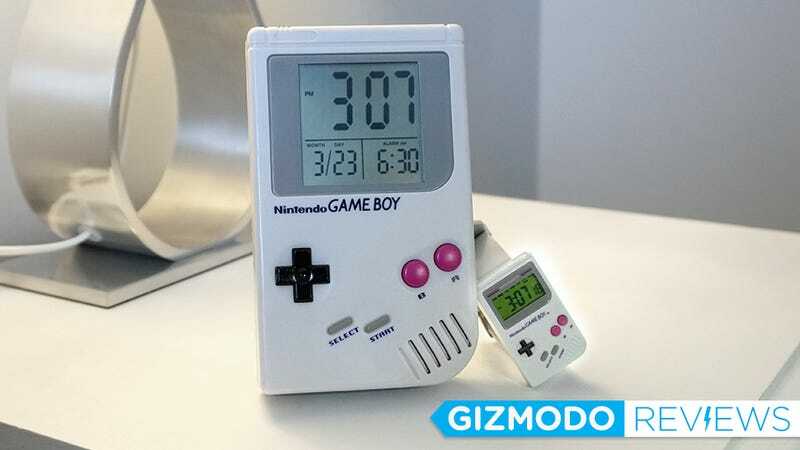 That explains why, despite every gadget I use having an alarm clock built-in, I now prefer waking up to this adorable Game Boy alarm clock and watch that each play the Super Mario Land theme. 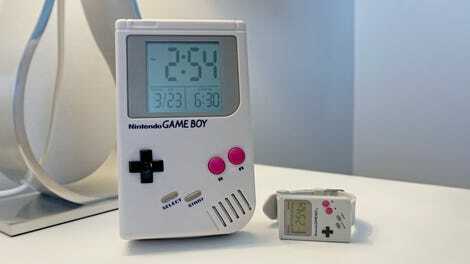 A basic digital alarm clock and watch that look like perfect replicas of the Nintendo Game Boy. The Super Mario Land theme is a warm hug of nostalgia. Neither device actually plays classic Game Boy games. As Nintendo continues to churn out Classic Editions of its most nostalgia-inducing consoles, the retro gaming fad is only going to keep getting bonus lives and time extensions. I’d be inclined to complain about this thinly-veiled attempt to sell me games I already purchased decades ago, but handheld versions of the The Oregon Trail, and tiny arcade machines that play Pac-Man, have made it easy to once again enjoy the games that defined my youth, without having to dust off old consoles, or battle emulator software. Let’s get the disappointment out of the way first, neither of these devices can actually play Game Boy games. In fact, as modern electronics go, they’re both rather basic when it comes to their functionality and features. If you need a robust alarm clock and don’t want to rely on a smartphone app, this isn’t it. If you want a fully-capable smartwatch, you’ll want to look elsewhere. But if you want to wake up every morning to your Game Boy’s bleep-bloop sounds, and strap a tiny Game Boy replica to your wrist, your search is over. Paladone did a first-rate job cloning the original Game Boy. Aside from a plastic housing that looks considerably brighter and cleaner than my original Game Boy that’s been in service for 29 years now, Paladone’s new alarm clock is a dead ringer for Nintendo’s original handheld. There’s even a non-functional slot on the back that I desperately want to cram a cartridge into. The working directional pad and ‘A’ & ‘B’ action buttons are used to set the time. The alarm clock’s Select and Start buttons don’t work, but the ‘A’ and ‘B’ action buttons do, as does the directional pad. They are all used for setting the time, date, and alarms. They even have the same tactile feel as the Game Boy’s buttons, but I wouldn’t mind a subtle label as to which was the all-important snooze button. Removable legs keep the alarm clock propped up on its own. On the back you’ll find a screw-secured door for swapping in a fresh set of AA batteries, and a pair of non-adjustable legs that keep the alarm clock propped upright on your bedside table. The supports are also removable if you want your faux Game Boy to lie flat, or if you want to try to figure out a way to mount it as a wall clock. The old-school LCD display is large and easy to read, but I would have preferred some more animated elements on it. If I had one complaint about the alarm clock, it would be the device’s use of an old-school segmented LCD display. It’s easy to read, but the Game Boy was the first handheld video game to use a pixelated screen that supported custom graphics and four shades of gray. Four! Imagine watching looped animations of classic Game Boy games playing out on this screen, and you’ll understand why I’m a little disappointed. Where the alarm clock doesn’t disappoint is when its alarm goes off, blaring a perfect rendition of the theme from Mario’s first outing on the Game Boy, Super Mario Land. You know that feeling of rage you usually get when you hear your alarm clock go off in the morning. If you grew up with the Game Boy, that will be replaced by a warm hug of nostalgia when it’s time to roll out of bed. Who needs a smartwatch when you’ve got a tiny Game Boy strapped to your arm? But if the only way you can wake up in the morning is with your smartphone’s alarm clock app going off every five minutes for a full hour, Paladone’s Game Boy watch squeezes just as much nostalgia into a wearable homage to ‘80s gaming. Sitting next to the larger version of the Apple Watch as a size comparison, this is the smallest Game Boy you can buy. 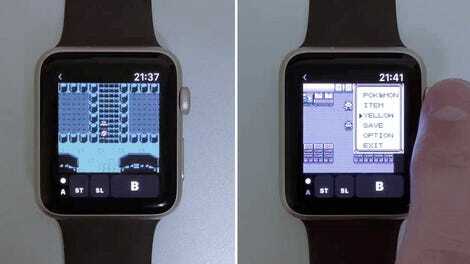 Roughly the same size as the larger version of the Apple Watch, this Game Boy wearable trails in features compared to almost every smart watch on the market. There’s no app support, no touchscreen, no scroll wheel, and no heart rate or motion sensors hidden away inside. It does boast a comfy silicon strap, tiny working Game Boy buttons used to set the time and date, and an alarm which also plays the Super Mario Land theme. Check out that ancient screen illumination technology. Again, a pixelated screen, reflecting the original Game Boy’s display technology, would have been a welcome addition here. But since classic digital watches are as popular as classic gaming hardware is right now, a lot of retro fans are going to like everything this wearable has to offer, as limited as that might be. If you’re a die-hard Nintendo fan, you’ve probably already ordered both at this point. I could spend days writing a 20,000-word dissertation examining and critiquing every aspect of both of these devices, but it would in no way sway the target market for these devices. The fact that you can buy an alarm clock and a cheap digital watch that both look like one of the most fondly-remembered devices in gaming history is the only feature that actually matters. The inclusion of the Super Mario Land theme as the alarm sound is just a bonus for die-hard Nintendo fans demanding that Paladone just shut up and take their money already. A basic alarm clock and digital watch that transcend their functional limitations thanks to a Game Boy-themed, nostalgia-inducing facade. The use of the Super Mario Land theme instead of a shrill beep should be standard on every watch and alarm clock. Neither of these devices actually play any classic Game Boy games, which is a missed opportunity. A cheap(ish) way to get another quick nostalgia hit.